Springfield Grangers say YES on Prop 37! Things have been quiet this August at the Springfield Grange. But that does not mean the work of community building and organizing as matrons and patrons of husbandry has stopped. The ideas for revitalizing our building and new community hub continue to pour forth. A group of Grangers, including Kathy Blue, Duncan Blue, Breeze Blue, Sandy Clickard, Jovita Molina, and Dvera Saxton got together to make a few banners, gearing up for election day 2012 (which, by the way, is Tuesday, November 6th). Grangers across California are taking a stand on a very exciting ballot initiative: Proposition 37, which would require the labeling of food products that contain genetically modified ingredients. GMOs (genetically modified organisms) are plant and animal varieties whose genetic material is altered, usually through the transfer of genes from one species to another, which produces novel features and effects. For agricultural crops, this has entailed the insertion of bacteria DNA into corn DNA, trout DNA into tomato DNA, and most recently, the “Arctic Apple“, which contains an extra enzyme to prevent natural browning. Despite the purported benefits (mostly false) that GMOs bring to the world, such as increasing yields, reducing hunger, and decreasing the use of pesticides, this kind of bio-engineering has many hidden costs. First, most of the GMO seeds produced cannot be saved by the farmer to plant the following year. Worse still, many patented varieties of seeds, owned by giant companies like Monsanto, Dow, and Dupont, “terminate” themselves after one season. The pollen from these plants can contaminate other farmers’ crops, limiting the choices they make on their farms and leaving them vulnerable to patent infringement lawsuits from agribusiness companies. Some farmers are fighting back, but the big seed and agro-chemical companies have plenty of money to counter-sue and appeal court decisions, making it difficult for small farmers to stay in business. New research also suggests severe health consequences from consuming products containing genetically modified ingredients. The founding Grangers of the late 1800s fought diligently against monopolies that threatened their livelihoods; namely, the railroad companies and the banks. These two groups made it very difficult for small farmers to thrive, by controlling access to and the cost of transporting goods to market and the cost of loans (which skyrocketed for people with few assets). In this history, there are so many parallels to the current state of affairs in the rural U.S. (and elsewhere in the world, too). Dvera and Kathy say YES on Proposition 37, Label GMOs! Thus, contemporary Grangers continue the struggle against monopolies and inequality in the rural U.S. 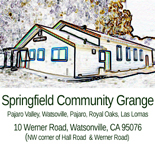 The Springfield Grange says YES on Proposition 37, and we hope you will, too. I love you website. You may be new Grangers, but you are certainly TRUE GRANGERS! Great prop 37 sign. Look forward to seeing one in espanol. You are keeping the true spirit of the Grange alive! Keep up the great work!!! Viva Springfield Grange! This entry was posted on August 18, 2012 by dveraisaxton in News.